Researchers said that 70 percent of the 13,000 people tumbling into homelessness quickly find work or rely on family to get off the streets. However, a quarter of those people, amounting to some 3,700, were experiencing periods of “continuous, unremitting, chronic homelessness,” when they were homeless four or more times within three years. 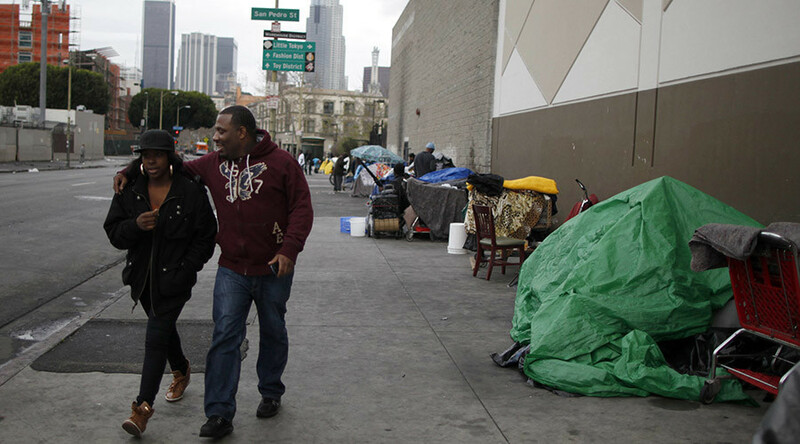 The problem is escalating despite 10,000 people having been placed in housing over the last three years, according to the report produced by a research organization based in Los Angeles called the Economic Roundtable. The population of Los Angeles County was estimated to be over 10 million by the 2014 United States census. The report found that half of all homeless public assistance recipients are children, and more than 100,000 of them do not have a home in an average month. In addition, the report claims that disabilities among children are underreported by as much as 90 percent. It also noted that African-Americans are six times more likely to be homeless public assistance recipients than other ethnicities. The report recommended that the welfare system intervene to help homeless children and young adults before their condition becomes chronic. It states that, without intervention by the state, their problems could compound, leading to disability and long-term dependence on public assistance. “Ending chronic homelessness will be feasible if fewer people become homeless,” Daniel Flaming, author of the report, told Al Jazeera America. The report found that 49 percent of indigent adults with disabilities in LA County, or 24,000 people, were eligible for monetary aid through Supplemental Security Insurance but not receiving it. Of those, five percent were homelessness adults. Researchers found that the wait time for federal housing vouchers in Los Angeles in 1999 was 10 years, but that the waiting list had been closed in 2004. They estimated that only one in 10 chronically homeless people was able to obtain a voucher. Homeless providers told the Los Angeles Times that, up until now, they had relied on anecdotal evidence and that this report was the first to reveal the scale of the problem. “It really brings home, just the sheer numbers. We’re talking about 13,000 a month. Even me who works in the field had no idea those numbers were out there,” Mollie Lowery of Housing Works told the LA Times. The report also points out flags that public assistance offices could use to determine when families were in danger of becoming homeless and in need of extra help. Some of the flags it lists are children not regularly attending school, long-term unemployment, and the presence violence in the home. The report’s authors also recommend that children receive early screenings for disabilities such as mental health and behavioral needs issues, and advocate home visits by public health nurses and connecting families to substance abuse rehabilitation services when needed. The report looked at the records of 9 million LA County residents who had been on public assistance at any time between 2002 and 2010.